Tuberculosis (TB) remains the largest cause of death among people living with HIV/AIDS, especially among those with profound immunosuppression. Case-fatality among co-infected patients occurs mainly in the first months after the TB treatment initiation. Therefore, robust data regarding optimal timing of HAART initiation within this early period is critically needed. The CAMELIA (CAMbodian Early vs. Late Introduction of Antiretroviral drugs) clinical trial is an open-labelled randomized clinical trial designed to compare the impact upon mortality of early (2 weeks) vs. late (8 weeks) HAART initiation after TB treatment onset in treatment-naïve adults with newly diagnosed acid-fast bacilli (AFB) positive TB and CD4+ cell count ≤ 200 cells/mm3. Patients received standard 6-month TB treatment plus stavudine, lamivudine and efavirenz in 5 hospitals in Cambodia, 2 in Phnom Penh and 3 in province. Patients were followed for 50 weeks after the last patient’s enrollment. A log-rank test was used to compare Kaplan-Meier survival curves. 661 patients (early, n=332; late, n=329) were enrolled with a median age of 35 yrs, body mass index of 16.7 kg/m2, CD4+ cell count of 25 cells/mm3 and viral load of 5.64 log copies/ml. All AFB-positive samples including sputum in 538 (81.4%) patients, were cultured. As of May 13, 2010, 149 patients were known dead (59, early arm; 90, late arm). 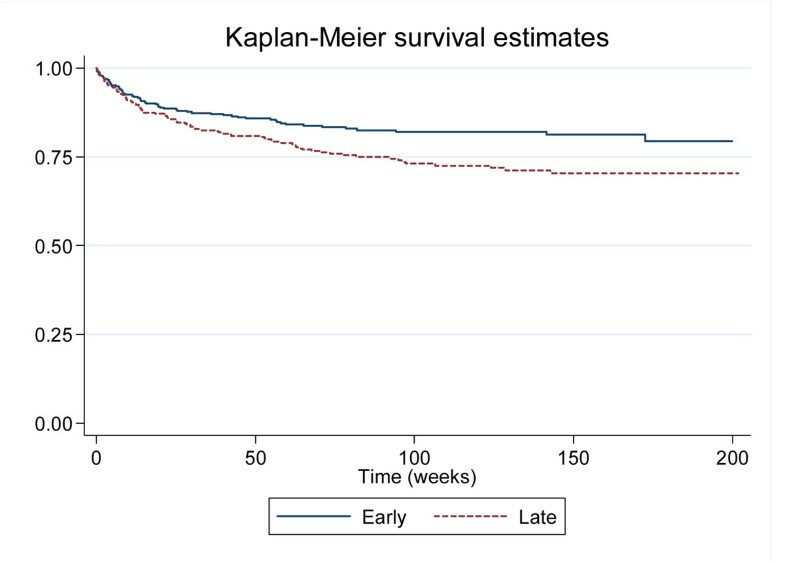 Enhanced survival was observed in the early arm (p=0.004, see figure). At week 50, median CD4+ gain was 114 cells/mm3 and was not statistically different across arms (p=0.22); 96.5% of patients had an undetectable viral load and again no difference across arms was found (0.82). Figure 1. Initiation of HAART 2 weeks after onset of TB treatment significantly improves survival in severely immunosuppressed HIV-infected adults with newly diagnosed tuberculosis. Supported by grants from ANRS (#1295/12160) and NIH-NIAID (CIPRA KH #001/10425).